The man who discovered the gold in 1863 and started the gold rush was named James Johnson, and he had the nickname of Bohemia. He was born in Missouri in 1830, and when he was 30 years old he had moved to Ashland, and working on a farm. In the 1860 census he listed his occupation as “miner” although he was living on another family’s farm and was probably a farm hand and mining in his spare time. In 1863 Mr. Johnson and his partner George Ramsey, who also listed his occupation as a “miner” had traveled to Roseburg. Here in Roseburg one of the two got into a fight and killed an Indian, and they both went on the run up the North Umpqua River. They followed the river until they came to Steamboat creek, and then they followed Steamboat creek until they came to City creek. Then they followed City creek up to its headwaters which is in the heart of the Bohemia mining district. Here, close the headwaters of City creek, James Johnson killed a deer and while dressing out the animal he looked down and saw a very rich piece of gold bearing ore.
It’s a certainty that he didn’t show this to his partner George Ramsey because Mr. Ramsey doesn’t appear on any of the mining claims and after this point is completely out of the picture. 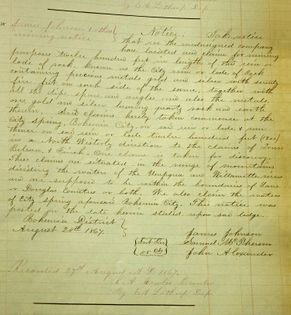 James Johnson filed a total of 12 mining claims between the year 1867 and 1869 and they are still on record in the Douglas county archives. We speculate that in 1864 Mr. Johnson spent the summer prospecting and laying out the monuments for his mining claims. In 1865 he returned with nearly 40 men, some of which were his new partners, in order to firmly establish which parts of the area he had laid claim to. For around two years nobody was putting any of the nearly 180 mining claims to paper, until Douglas county sent a clerk up to the area to begin recording the claims. Mr. Johnson began recording his claims in August of 1867, and the one that made him the most money was called the Excelsior. A few months after he filed on the Excelsior he turned around and sold it to Steven F. Chadwick who would eventually become Oregon’s 5th governor. Mr. Chadwick who was a Douglas county judge at the time, and his son Baker, paid Mr. Johnson $1500.00 for the Excelsior, which at the time was the equivalent to a couple million dollars. Mr. Johnson eventually sold the remainder of the Excelsior claim to Joseph Knott for $250.00 who installed a stamping mill and began processing the gold. There’s hand written documents for both of these sales in the Lane county archives and on the signature line on each of them James Johnson signed his name with an X. He evidently was illiterate (as many people were at the time), but by the way he handled his business affairs it’s apparent that he was a shrewd individual. After this point there is no more mention of Bohemia Johnson in any of the records and it’s assumed that he left the area. Mining historian Ray Nelson said that James Johnson sometimes went by the name of John. Also, there was an obituary found at the Cottage Grove Genealogical Society for a man with that same name that was born in the correct year. The obituary said he was a wealthy miner from Cottage Grove and he died in Denver Colorado in 1905. His probate took place in Chaffee County Colorado at which time Mr. Johnson’s widow took possession of a house at 1653 Main Street in Cottage Grove. There is much circumstantial evidence pointing to this man as being our Bohemia Johnson, however, there is nothing definitive, or no solid proof that he was the same man. So we may never know for sure what happened to the man who had such a monumental impact on our town. 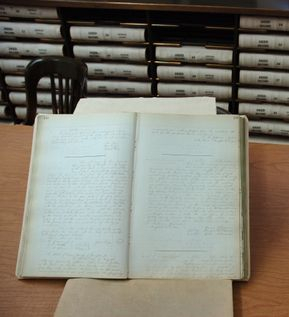 The book of mining claims that were filed in the 1860's and found at the Douglas County Archives. 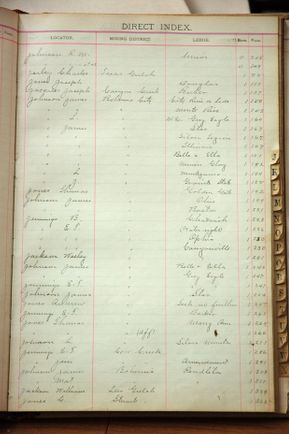 These are entries listed in the index book that shows some of Bohemia Johnson's mining claims. This is one of the twelve mining claims filed by James (Bohemia) Johnson found in the mining claim book in the Douglas County Archives. 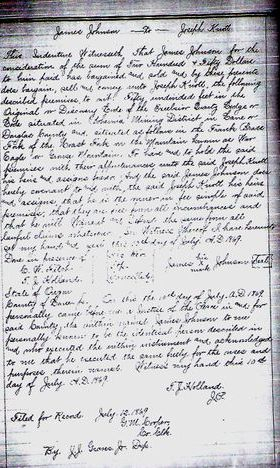 This is the hand written agreement documenting the sale of part of the Excelsior mining claim by James Johnson to Joseph Knott.